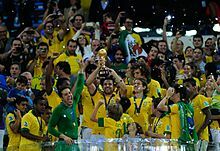 The 2013 FIFA Confederations Cup was the ninth FIFA Confederations Cup, which was held in Brazil from 15 June to 30 June 2013 as a prelude to the 2014 FIFA World Cup. The most recent winners of the six continental championships appeared in the tournament, along with hosts Brazil and UEFA Euro 2012 runners-up Italy, who qualified because the Euro 2012 winners, Spain, had also won the most recent FIFA World Cup in 2010 thus securing a spot in the tournament. Host nation, Brazil successfully defended their title with a 3–0 win over Spain in the final. It was their fourth Confederations Cup title and third in a row, after previous wins in 1997, 2005 and 2009. According to then FIFA president Sepp Blatter, the 2013 FIFA Confederations Cup was the best version of the tournament ever played. The competition was the first national team tournament to employ goal-line technology, which was also used at the 2014 World Cup. 1Note: Italy was awarded a spot in the competition because Spain had won both the 2010 FIFA World Cup and UEFA Euro 2012. Since both competitions award their winners a place in the FIFA Confederations Cup, the runner-up of UEFA Euro 2012 received an invitation to the tournament. Six stadiums were used, each in a different city. The draw for the competition was held at the Palácio das Convenções in the Anhembi Convention Center in São Paulo, Brazil on 1 December 2012. Teams from the same confederation were not drawn into the same group, therefore one team each from UEFA and from CONMEBOL was drawn in each group. Brazil and Spain had automatically been assigned as A1 and B1 respectively, therefore Italy and Uruguay were assigned respectively to Group A and Group B. Ten trios of officials were announced by FIFA on 13 May 2013. Teams had to name a 23-man squad (three of whom must be goalkeepers) by the FIFA deadline of 3 June 2013. The squads were announced by FIFA on 7 June 2013. The competition's dates were confirmed by FIFA on 27 July 2011 in the build-up to the draw for the 2014 World Cup's preliminary qualification rounds. As the competition partially overlapped with the fourth round of the 2014 FIFA World Cup qualification in Asian zone, the Asian Football Confederation (AFC) asked FIFA to consider a change of date. However, the AFC decided that the match day would only be adjusted for the AFC representative at the Confederations Cup, Japan. The official final schedule was presented in Rio de Janeiro on 30 May 2012. All times listed are Brasília official time (UTC−03:00). Drawing of lots by the FIFA Organising Committee. Brazil won the competition after beating Spain 3–0 in the final. In the knockout stage, if a match was level at the end of normal playing time, extra time would be played (two periods of 15 minutes each) and followed, if necessary, by a penalty shoot-out to determine the winner. Fernando Torres was awarded the Golden Boot award on tie-breakers. Both he and Fred scored five goals and made one assist, but Torres was given the award due to having played fewer minutes over the tournament. In total, 68 goals were scored by 38 different players, with three of them credited as own goals. The official match ball for the Cup was produced by Adidas, a development of the Adidas Tango 12. It was unveiled during the draw for the competition. The ball is named "Cafusa" (pronounced [kɐˈfuzɐ]) – a syllabic abbreviation of the words "carnaval" (Carnival), "futebol" (football) and "samba", aside of being homophonous with cafuza, the Portuguese name for a zamba i.e. a woman of mixed Amerindian and black African descent. Former Brazil captain Cafu was invited to officially unveil the ball. The competing national football associations received prize money from FIFA based on their representative team's final finishing position. The 2013 FIFA Confederations Cup was the first international tournament for national teams to use goal-line technology. The IFAB officially approved the use of goal-line technology in July 2012, and it was first used in a FIFA competition for the 2012 FIFA Club World Cup in December 2012. Having trialled systems from both Hawk-Eye and GoalRef during the Club World Cup, FIFA announced on 2 April 2013 that the German technology GoalControl had been chosen as the official goal-line technology for the 2013 FIFA Confederations Cup. Its system, GoalControl-4D, uses 14 high-speed cameras located around the pitch and directed at both goals. It was used in the match for third place between Uruguay and Italy to determine the scorer of Italy's first goal. Protesters on the streets of Rio de Janeiro. Their sign translates to "If the bus fare doesn't drop, Rio is going to stop!" Prior to the opening ceremony at the Brasilia National Stadium on 15 June, demonstrations took place outside the stadium, organised by people unhappy with the amount of public money spent to enable the hosting of the FIFA World Cup. Police used tear gas and pepper spray to quell the protests. The demonstrations were part of wider unrest and rioting in Brazilian cities initially sparked by increased ticket prices on public transport, but growing to express deeper public disenchantment with the financial management of the country by its government, specially due to the high inflation. The Brazilian president Dilma Rousseff as well as FIFA president Sepp Blatter were heavily booed as they were announced to conduct their speeches at the tournament's opening. Further protests took place the following day prior to the game between Mexico and Italy in Rio de Janeiro. Blatter said that the protesters "should not use football to make their demands heard", and that the public expenditure on staging the tournaments was on "items that are for the future, not just for the World Cup". As the protests continued to intensify during the week, with a reported participation of over a million people taking to the streets in a hundred different towns and cities, reports in the Brazilian media suggested that FIFA was having to negotiate with the teams to keep them in Brazil and that the tournament could be abandoned. However, a FIFA statement on 21 June insisted that "to date, neither FIFA nor the local organising committee have ever discussed any such possibility of cancelling the FIFA Confederations Cup". FIFA General Secretary Jérôme Valcke subsequently admitted that FIFA had held a "crisis meeting" involving the Brazilian government regarding the completion of the tournament, but sought to distance FIFA from the wider social unrest, stating that "the most important thing for us is to detach the World Cup or the Confederations Cup from these problems. We are not the answer to all problems and we are definitely not the reason for such a crisis. We are just part of what Brazil is doing for the next 20 years....the light FIFA is being shown in here, is the wrong one". He also reaffirmed that the protests had not caused FIFA to consider moving the 2014 World Cup away from Brazil. Just before the final in Rio de Janeiro, a large crowd marched towards the stadium both in support of the team and in continuation over the original protests. Though largely peaceful, there were some disturbances. 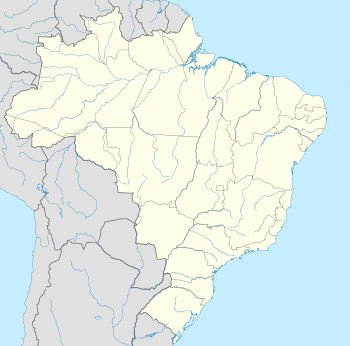 ^ The Portuguese pronunciation is [ˈkɔpɐ dɐs kõfedɛɾɐˈsõjz dɐ ˈfifɐ bɾɐˈziw ˈdojz ˈmiw i ˈtɾezi] in Brazil's standard pronunciation. ^ "Plenty to look forward to in 2011". FIFA.com. Fédération Internationale de Football Association. 27 May 2008. Retrieved 6 February 2013. ^ "FIFA launch GLT tender for Brazil 2013/14". FIFA.com. Fédération Internationale de Football Association. 19 February 2013. ^ "FIFA Confederations Cup Brazil 2013: Destination". FIFA.com. Retrieved 16 June 2013. ^ "FIFA Confederations Cup Brazil 2013: Destination – Arena Pernambuco – Recife". FIFA.com. Retrieved 16 June 2013. ^ "FIFA Confederations Cup Brazil 2013: Destination – Estadio Nacional de Brasilia – Brasilia". FIFA.com. Retrieved 16 June 2013. ^ "FIFA Confederations Cup Brazil 2013: Destination – Estadio Do Maracana – Rio de Janeiro". FIFA.com. Retrieved 16 June 2013. ^ "FIFA Confederations Cup Brazil 2013: Destination – Estadio Castelao – Fortaleza". FIFA.com. Retrieved 16 June 2013. ^ "Draw that will decide the calendar of the 2014 FIFA World Cup matches will take place in Bahia in 2013". Copa2014.gov.br/en. 29 June 2012. ^ "Brazil drawn with Italy, Spain to meet Uruguay". FIFA.com. Fédération Internationale de Football Association. 1 December 2012. ^ "Draw Procedures: FIFA Confederations Cup Brazil 2013" (PDF). FIFA.com. Fédération Internationale de Football Association. ^ "Match officials appointed for FIFA Confederations Cup Brazil 2013". FIFA.com. Fédération Internationale de Football Association. 13 May 2013. ^ "Match officials for FIFA Confederations Cup 2013" (PDF). FIFA.com. Fédération Internationale de Football Association. ^ a b c d "Regulations – FIFA Confederations Cup Brazil 2013" (PDF). FIFA.com. Fédération Internationale de Football Association. ^ "Brazil 2013 squads revealed". FIFA.com. Fédération Internationale de Football Association. 7 June 2013. ^ "Squad lists for the FIFA Confederations Cup Brazil 2013" (PDF). FIFA.com. Fédération Internationale de Football Association. ^ "Pot allocations for the Preliminary Draw". FIFA.com. Fédération Internationale de Football Association. 27 July 2011. ^ "AFC asks FIFA to change Confed Cup dates". the-afc.com. 31 January 2011. Retrieved 6 February 2013. ^ "43 in the fray for 2014 FWC qualifiers". Asian Football Confederation. 23 March 2011. Retrieved 5 April 2011. ^ "FIFA Confederations Cup Brazil 2013 match schedule presented in Rio de Janeiro". FIFA.com. Fédération Internationale de Football Association. 30 May 2012. ^ "Match Schedule – FIFA Confederations Cup Brazil 2013" (PDF). FIFA.com. Fédération Internationale de Football Association. ^ "FIFA Confederations Cup Brazil 2013 | Awards". FIFA.com. Fédération Internationale de Football Association (FIFA). Retrieved 20 October 2017. ^ "FIFA Confederations Cup Brazil 2013 | Awards". FIFA.com. Fédération Internationale de Football Association (FIFA). Archived from the original on 8 July 2013. Retrieved 2 November 2017. Julio Cesar; Dani Alves, Sergio Ramos, Thiago Silva, David Luiz; Andres Iniesta, Andrea Pirlo, Paulinho; Neymar, Fernando Torres, Fred; Luiz Felipe Scolari. ^ "Fernando Torres wins another Golden Boot award, is understandably less than excited about it". sports.yahoo.com. 1 July 2013. Retrieved 1 July 2013. ^ "Players – Top goals". FIFA.com. Fédération Internationale de Football Association. Retrieved 24 June 2013. ^ a b "Adidas Cafusa launched at Brazil 2013 draw". FIFA.com. Fédération Internationale de Football Association. 1 December 2012. Retrieved 1 December 2012. ^ "Prize money up by 14 per cent". FIFA.com. Fédération Internationale de Football Association. 15 February 2013. Retrieved 18 June 2013. ^ "FIFA appoints goal-line technology provider for Brazil 2013". FIFA.com. Fédération Internationale de Football Association. 2 April 2013. ^ "Fifa snubs Hawk-Eye in favour of German goalline technology". The Guardian. Guardian News and Media. 2 April 2013. Retrieved 4 April 2013. ^ a b "Brazil Beats Japan, Protests Spoil Confederations Cup Opening Day". Voice of America. Brasília: Federal government of the United States. 15 June 2013. Retrieved 16 June 2013. ^ "Brazil Maracana stadium protest ends in clashes". BBC News. 16 June 2013. ^ "Brazil despair: Protests over transport, inflation gain intl support (PHOTOS) — RT News". Rt.com. Retrieved 18 June 2013. ^ Peck, Brooks (29 May 2013). "Sepp Blatter, Brazil president Dilma booed at Confederations Cup opening ceremony". Sports.yahoo.com. Retrieved 16 June 2013. ^ Sturm, Heloísa Aruth; Torres, Sérgio; Rogero, Tiago (16 June 2013). "Grupo organiza um protesto neste domingo no Maracanã". O Estado de S. Paulo (in Portuguese). Rio de Janeiro: Grupo Estado. Retrieved 16 June 2013. ^ "Confed Cup protests continue". ESPN. 17 June 2013. Retrieved 17 June 2013. ^ a b "Brazil protests continue". ESPN. 19 June 2013. ^ "Brazil unrest: 'Million' join protests in 100 cities". BBC News. 21 June 2013. ^ "Protests could halt Confederations Cup – Brazilian media". Reuters. 21 June 2013. ^ "FIFA has not discussed cancelling Confederations Cup". Reuters. 21 June 2013. ^ a b c "Brazil will definitely host World Cup 2014, says Fifa". BBC News. 24 June 2013. Wikimedia Commons has media related to 2013 FIFA Confederations Cup.